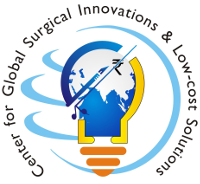 Our center is a patient’s need-driven innovation center plus ideas-genesis-incubation lab for low-cost surgical solutions which can be used on a wider Global scale. Cost of health-care technology has been spiraling up alarmingly, and even developed countries have to tighten their budgetary belts to cope with this expenditure. We believe that Science and Technology are the two sides of the same coin; while Technology is expansive and commercially driven thereby not available to large number of patients, Science is free and universally available. The ‘Team Innovation’ identifies patient’s need and then tries to innovate and find a low-cost surgical solution – with the help of Science. 'Team innovation' is known for its ability to learn from every one. We encourage our students and faculty members to voice their questions, concerns and ideas. Our preferred method of interaction is via “Socratic Dialogue” which allows healthy discussion in a question-answer pattern in which everyone participates. New ideas are encouraged as the young minds are very fertile and we want them to inculcate a deductive mind set. Once a good idea is identified it is translated in an ethical scientific manner to patients’ benefit. The team is alive to its mentorship responsibilities and tries to nurture and guide young talents. Our mentoring is not limited to our own institution but is available to anyone who approaches us with their nascent ideas. Global surgery is an area of study, research, practice, and advocacy that seeks to improve health outcomes and achieve health equity for all people who require surgical care, with a special emphasis on underserved populations. [1-6] Research workers and institutions in developing world are the major stake holders in this new science of ‘Global surgery’. Our innovation center is our commitment to provide academic leadership in this emerging field. Farmer P, Kim J. Surgery and global health: a view from beyond the OR. World J Surg 2008;32:533–36. Koplan J, Bond T, Merson M, et al. Towards a common definition of global health. Lancet 2009;373:1993–95. Kim J. Video transcript of the opening remarks by Jim Kim, President of the World Bank, to the inaugural meeting of the Lancet Commission on Global Surgery. Lancet Commission on Global Surgery; Boston, MA, USA; Jan 17, 2014. Meara JG, Leather AJ, Hagander L, et al. Global Surgery 2030: evidence and solutions for achieving health, welfare, and economic development. Lancet. 2015 Aug 8;386(9993):569-624. Our team has been working on these ideas – informally - for a long time with many successful publications. We are fortunate that our team could develop and popularize many innovative original low-cost surgical techniques of great relevance for developing countries; these are being widely used in small hospitals as they do not require expensive instrumentation. Over the years we have faced many demands for compilation of our work in a single space to allow easy access to our oeuvre. This has prompted us to formalize our philosophy in to this single entity, hence the birth of this Innovation Center. Our center will be contained within Department of Surgery, NSCB Government Medical College, Jabalpur (MP) India 482 003. True to our commitment everyone will contribute in an honorary capacity; in addition to doing justice to their routine work. In the purest pursuit of science, there is no financial involvement of any kind, we don’t seek any grant or fund and feel privileged to contribute in honorary voluntary capacity as a payback to society.